You’ll be doing your readers a big favour if you make it easy for them to skim read your marketing materials… And it helps your sales, too! When was last time you read a company’s marketing blurb (be it a website, brochure or whatever) word for word? It’s rare to read marketing materials word for word – unless you’re really interested in what they’re saying, right? Your own prospects and customers are no different. Skim-reading is a way of life in the fast-paced, high-tech world we live in. Therefore, for your marketing to be effective, you need to acknowledge that and make it easy for people to skim-read your marketing. What are the benefits of encouraging people to skim-read? Encouraging your prospects to skim-read is a good idea. Why? By letting their eyes glance at the information in a way that they can absorb it quickly means that your prospect is more likely to retain the knowledge and information. 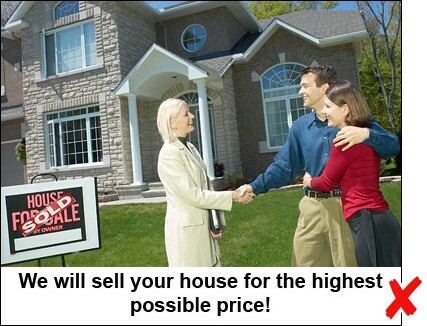 In turn, this means that you’re more likely to make the sale! If you’re not convinced that letting people skim read will help your sales, imagine the opposite scenario. In this instance, imagine big huge chunks of dense text. Unless you’re an academic, the big chunks of text are visually very daunting. You subconsciously think, “yikes, that looks intense and boring” when you see a solid mass of words. In the photo below are two articles from the same magazine. Here are two articles from the same magazine: the one on the left is easy to skim read, thanks to the sub-headings, bullet points and bold formatting of key points. The article on the right is visually very intimidating to read because of the dense text. The article on the left has sub-headings, bold, bullet points… whilst the article on the right is a solid mass of words, with no “breathing space” around them. Which would you rather read (if they were both on the same topic)? I know which I’d prefer to read… and your prospects are no different. They’d rather read information that’s broken down into digestible, consumable chunks than be confronted by intimidating blocks of information. 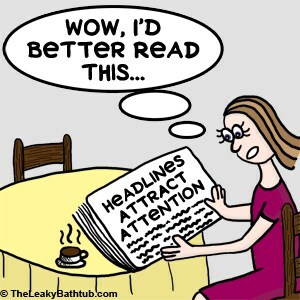 An enticing heading is the important first step in making sure that your marketing piece gets read. After all, if your piece doesn’t grab the reader’s attention, your effort is wasted! Meaningful sub-headings help to break down the information on the page, and let the eye navigate the information. Notice how this article uses this technique to break down the information into easy, navigable chunks. You can quickly pick up the main messages of this article, even if you don’t read every single word. 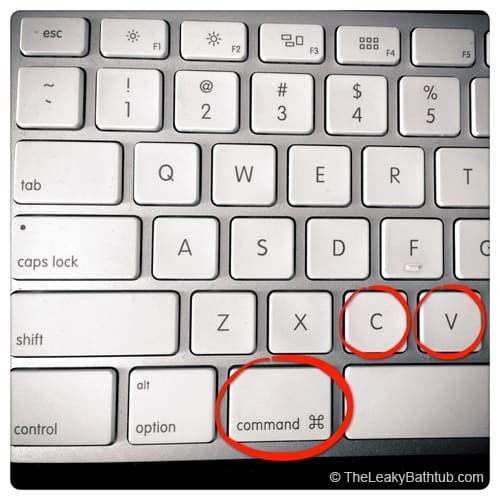 Make sure you employ the same technique in your own writing! The trick is to make the sub-headings meaningful (i.e. longer than just one word), and to put them in bold so they stand out. Sometimes it’s nice to use a larger font size than for your body copy, too. Bonus tip: Use colours for your headings and sub-headings: this helps them to stand out. Pure black-and-white copy can look very flat and dull. Choose a colour and use it consistently (it should be a colour that matches your corporate colour scheme). Marketing and sales copy should be snappy and punchy – and that means using short sentences. Using long sentences confuses readers… and why make it difficult for people to read your materials? Short sentences are easy to read, and easy to understand. And “easy to read and easy to understand” are highly-desirable characteristics of sales and marketing copy! Notice too how I’ve used short paragraphs in this article. In fact, most paragraphs are one to five sentences long. (a) The white space between the paragraphs gives the copy some “breathing space”. This is attractive to people visually, so they are more likely to read your content. So it helps with attracting attention and getting read. (b) The “breathing space” allows readers to digest the information you’re telling them. The gaps between the paragraphs are like little mini-breaks for the brain, that allow new information to sink in, bit by bit. So this helps with readers absorbing what you have to say, and taking action. Headings and sub-headings should be in bold, but other important words could be in bold too, so that they really stand out. A word of warning though: don’t be tempted to over-use this technique, or your marketing piece will look cluttered. Use this sparingly! Do you have a whole list of things to say? Then put them in a bulleted list! Again, this breaks down the information nicely. It’s simply a lot easier to read a bulleted list than a long, rambling line of information. Bonus tip: Put the most important words at the beginning of the sentence. This will help the reader pick up the important information even if they don’t read the whole sentence. Why? People tend to scan vertically down the left hand side as they read. So if the important words are all on the left, the words will get noticed. Extra bonus tip: When you’re using bullet points and putting the most important words at the beginning of the sentence, consider making those important words bold. This will help them to stand out even more and your copy will be super-skim-readable! A picture really does paint a thousand words. Good graphics help to get attention – and they also help to lock your message into readers’ minds. Don’t just use a photograph without putting it into context – otherwise it could raise more questions than it answers. Instead, be sure to write a meaningful caption with every photograph that you use. Underlining words for emphasis looks amateurish. Pick up any book, and I bet there will be no underlining. Professional typesetters and publishing companies simply don’t use underlining. The only time when it’s OK (and preferable) to underline is online, for hyperlinks. This is a good idea for usability because it lets readers know that the text is a hyperlink. To demonstrate this point, I am purposely writing a whole paragraph in italics. Perhaps you’re tilting your head to the side a little bit to read it… maybe even squinting your eyes a little… am I right? In other words, large chunks of text in italics are difficult to read – and even more so online than in print. I have no idea why that is, but computer screens and italics do not go well together! This applies to email marketing (newsletters, autoresponders and sales emails) as well as to website copy. You may use italics selectively for emphasis, for perhaps a word or a sentence… but no more than that, please! I often see people putting testimonials on their website in italics, and this is incredibly hard to read. You are better off using your normal type style, and putting the testimonial-giver’s name in italics. It’s more enticing to read copy with “breathing space” than words that are crammed tightly together. If your copy lets prospects easily skim read it, it is therefore more likely to get read. The “breathing space” also lets readers’ brains absorb the information, so your message is more likely to stick. Avoid making the common mistakes of underlining for emphasis (except for hyperlinks) and excessive italics (just a word or sentence for emphasis is enough). 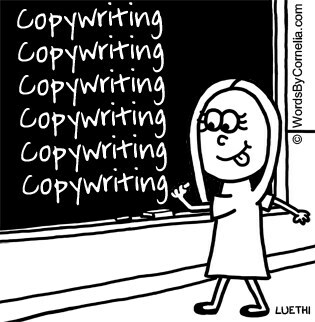 Do you need help with your copywriting projects? Cornelia Luethi (founder of The Leaky Bathtub) specialises in writing website copy, email autoresponders and articles for English-speaking clients the world over. Visit Words By Cornelia for full details on these copywriting services. It’s vital that your website’s Contact Us page makes it easy and enticing for prospects to contact you. 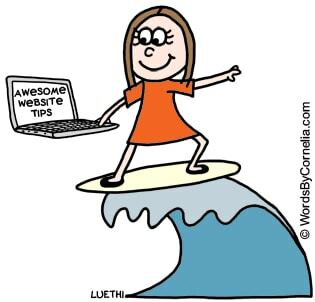 What action would you like your readers to take when they look at your website? Do you want prospects to contact you? Perhaps to make an appointment, or to request a quote? But what happens when people visit your Contact Us page? Is your Contact Us page carefully crafted to sound friendly and inviting? It doesn’t make sense when you stop to think about it, does it? If “Contact Us” is the primary call-to-action on your website, then you need to put a bit of effort in when you write a Contact Us page. Don’t just go straight to the nitty-gritty contact details, as that can come across as being rather abrupt. Instead, add a sentence or two right at the beginning of your Contact Us page that makes your company sound friendly and approachable. 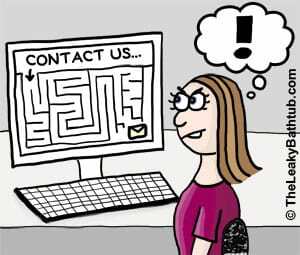 Even if your website has an enquiry form, you should always always include an email address as well. Read my article to find out why you should include an email address. You should be aware that lots of people (a) hate filling out forms, and (b) have filled out forms, only to never hear from the company they’ve contacted. So treat contact forms with caution. NEVER use CAPTCHA – you know, those awful codes you have to input to prove that you’re not a robot or a spammer. Most of them are totally illegible and incredibly frustrating. Read my rant about CAPTCHA – which includes a far better (and totally unobtrusive, human-friendly) solution. Putting an address on your website is vital for building trust, as it shows that you are a real, actual business. Now, here in New Zealand things are a bit quirky in that many businesses get their mail delivered to a PO (Post Office) Box rather than to their physical address. That’s the norm here. I have no idea why. But having PO Box address is good for work-at-home businesses, like myself. 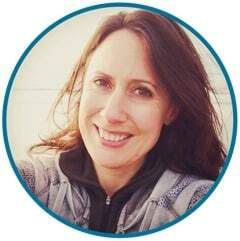 A friend of mine, who also works from home, initially put her physical address on her website and business card, and then had an unexpected visit from a client – whilst she was in her pyjamas! Oops! In this scenario, by using a PO Box address you can still build trust, but without having to worry about strangers seeing your PJs. Opening hours: You would be amazed at the number of physical retailers that don’t put their opening hours on their website. Craziness! By appointment only: Don’t have set opening hours? Then tell readers that they are welcome to visit, but must make an appointment first. That way they know where they stand, and what to do. Car parking information: Visiting a business can be stressful for people, especially if they’re not familiar with the area. It can also be incredibly frustrating to get somewhere and find out that there’s no parking available, or that they need change for the parking meter. Visitor Parking: make it clear if you have Visitor Parking, and what the procedure is for parking there (for example, does the space need to be pre-booked?). Other parking: If you don’t provide parking, tell readers where they can park, and if they need to pay for the parking, tell them what the payment methods are (e.g. cash, credit card, TXT-a-park, etc.). This is hugely valuable for people like me who never carry cash! Time limits: Also, if there’s a time limit on the parking (e.g. 30 minutes, an hour, two hours), let people know. You’d be making a very big negative deposit into your customers’ emotional bank balances if they were to get a parking ticket, clamp or towed as a result of visiting your business! Photograph of your building’s exterior: Makes it easy for prospects to find your business. Map: Ditto! My preferred tool is Google Maps… not only is it free, but their maps are also interactive and let users get directions… very handy! Directions: If your premises are difficult to find, include written directions as well. Public transport links: If your customers take public transport to travel to you, include this information. E.g. : bus route(s), location of nearest bus stop or train station, etc. (a) Put your preferred phone number at the top of the list. (b) Make your preferred phone number bold and stand out. (c) Make it clear that that’s your preferred number, e.g. by saying “this is the best number to call us on” next to it. Also, if you prefer being contacted by phone than email, then put your phone number(s) nearer the top of the web page, and the email details below it. Anything else that you use! Tip: set up these links to your social media profiles so that they open in a new web browser window (the HTML code for this is: target=_blank). This means that visitors won’t be taken away from your company website. You could include your Facebook Feed or Twitter stream here, but that’s not essential. Remember, the goal of the Contact Us page is to encourage prospects to contact you. And making your company look friendly and approachable will really help with that. So be sure to include some staff photos on your Contact Us page. Photos help with trust building – and also help with building rapport. Or if you’re a one-person business, use your own photo and write a suitable caption. Finally, end the page with your signature, name and credentials. This helps with building trust – you can read all about using signatures for trust building here. Is there a really important message you’d like to remind people of before they leave your site? Then include it in a “PS” message at the end. PS messages do get read, and if people have scrolled to the bottom of your Contact Us page (and haven’t made contact), then point them towards some other useful content on your website. The person reading this message is likely to be a “Tentative Tom“, so your job is to give them all the information they need to spur them into contacting you. 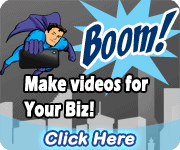 Newsletter sign-up: Get all the latest tips for free! Pick just one message in your PS… if there’s more than one option, the reader will probably feel overwhelmed! “Contact us” is the main call-to-action on many small business websites, yet many businesses throw these pages together quickly without much thought. A good contact us page helps with conversions – and also helps to build rapport with your prospects. Have you noticed how some movies have you glancing at your watch after just 45 minutes? Yet other movies have you on the edge of your seat for nearly 2.5 hours. So what’s the ideal length of a movie? I’d say that it needs long enough to do the job. When a movie is considered “too long” it’s usually because the plot wasn’t very strong, or the pace of the movie was too slow. After all, there’s no point rambling on for the sake of it, to meet some imaginary word limit. Likewise, if you make an article too short so it can fit into a teeny-tiny little space, you might confuse your readers if you don’t give them enough information. The articles on this blog vary dramatically: some are just 400 words long; others are nearly 3,000. I write my articles not to suit a word limit, but to do the topic justice. And for most of the time, following that approach that will be fine: there are only a couple of instances where word count matters. 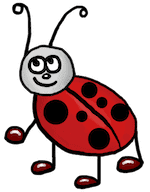 The search engines like information-rich websites with unique, quality content. So if search engine rankings matter to you, it’s worth sticking to their guidelines. And for good rankings you need a minimum of 250 words of optimised copy per web page. That’s the absolute minimum; if you can get the word count to over 500 words, that’s even better. If you’re submitting an article to a magazine or other print publication, you’ll usually have to write to a strict word count. That’s so that your piece will fill the space available (but without overflowing). Those are the most common places where there’s a word limit… the rest of the time, just make sure that your article is long enough to do its job well. And a good article has much in common with a good movie. 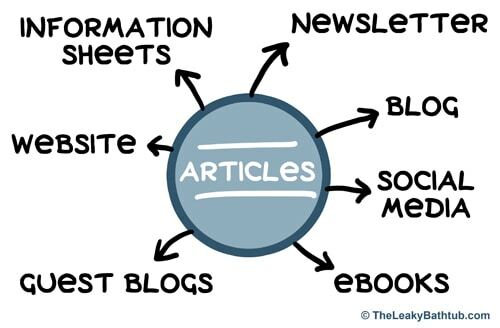 What are the components of a good article? 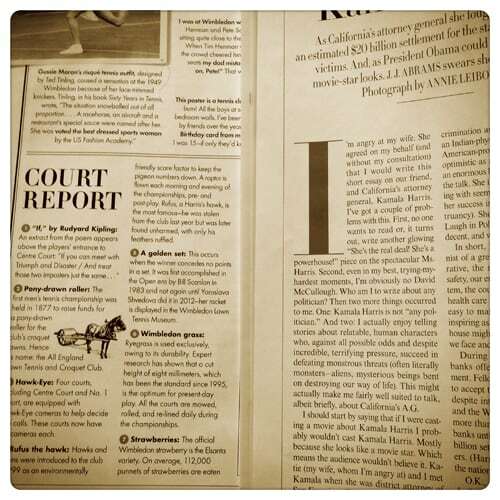 An article needs to be well-structured, which means that the topic needs to flow. You can’t jump around all over the place and expect readers to follow… otherwise it’ll be like one of those confusing ‘flashback’ style movies. And that’s not a good thing in marketing! Your article needs to stride along at an appropriate pace. On one hand, you don’t want to ramble on about something too much, but you don’t want to be so brief that no-one knows what you’re talking about. Again, if you spend some time outlining your article, it’ll help with the pace. Movies don’t (usually) have the same camera angle and same set for the entire duration. There’ll be indoor scenes. Outdoor scenes. The story’s broken up into segments to keep you interested. The same applies in article writing, and the technique you use to achieve this is sub-headings. Notice how this article has sub-headings throughout to pull you through it, and to hold your attention. This is much more engaging than writing one long, endless article without an intermission! I don’t like horror movies. Or sci-fi movies. And I’m not big on Westerns either. You probably have your movie likes and dislikes too. And when it comes to reading, we all have different topics that interest us. Thus it makes sense that when we’re writing, we’re totally focused on writing about topics that our audience (customers and prospects) will enjoy. Movies that go on and on and on are boring. So are articles that ramble. And the mistake that many novice writers make is to stuff their article full of irrelevant words. My tip: after you’ve written the article, leave it for a day. Look at it with fresh eyes the next day, and get busy with the ‘delete’ button. Edit out any words or sentences that aren’t needed. Think of it like the cutting room: in the movies they don’t show every minute of film footage. Nope, most of it’s left on the cutting room floor, so that the cinema-goer can see just the best bits. That’s what makes a movie compelling – and also an article. There’s usually no ‘ideal’ length for an article – it simply needs to be long enough to do its job well. To achieve that, begin by outlining your article: that will help you structure it well, and keep the writing moving along at a nice pace. Break up the article with sub-headings, and make sure that you’re using language that your audience will understand. If you want your email marketing to zoom along nicely, you shouldn’t ask people to ‘subscribe’. Discover why ‘subscribe’ is a poor choice of word – and what’s a better alternative. Eh? That sounds crazy, right? Surely you’d want prospects to subscribe to your newsletter? After all, my last article was all about how to get more email newsletter sign ups from your website. While you want to grow your email opt-in list, you need to be very careful about how you ask people to do that. Your choice of words has a big influence on how your readers will react to what you’re offering… and the word ‘subscribe’ is a big turn-off. As Derek Halpern points out in his article on Copyblogger, ‘subscribe’ has negative connotations for people. You subscribe to magazines and newspapers: i.e. you pay money to receive these items. You also subscribe to services such as internet plans, telecommunications, and so on. She subscribes to several women’s magazines. I subscribe £10 a month to the charity. Existing shareholders subscribed to only 49% of the new share issue. Thus people to tend to equate the word ‘subscribe’ with expense, commitment, hassle… stuff they don’t want. So how do you get people to sign up? It’s simple: instead of using the word ‘subscribe’, you use the word ‘get’. ‘Get’ is a lot more casual. For example, people get a bottle of milk from the shop. They get a haircut. They get a present. Or get a hug. He’s gone down to the corner shop to get some milk. We stopped off on the motorway to get some breakfast. Where did you get your radio from? I got quite a surprise when I saw her with short hair. I got a (telephone) call from Phil last night. What did you get for your birthday? Does using the word ‘get’ really make a difference to newsletter sign up rates? Apparently, yes, it does. Here’s an article on how one person improved their sign up rate by 254%. Sure, that’s just one person, but I can see how that might work. People react very differently to certain words. So if I were you, I’d recommend that you tweak your website to use the word ‘get’ instead of ‘subscribe’. It’s a quick job, and one that could make a very big difference to your business! Instead of asking people to ‘subscribe’ to your newsletter, ask them to ‘get’ your newsletter. 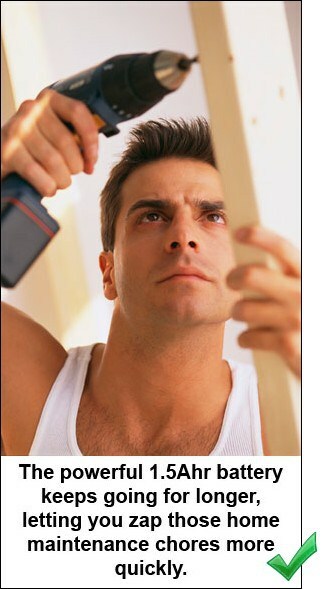 Then test and measure to see what effect that has on your sign-up rates. It’s important that you realise which Benefits and Features matter most to your customers. 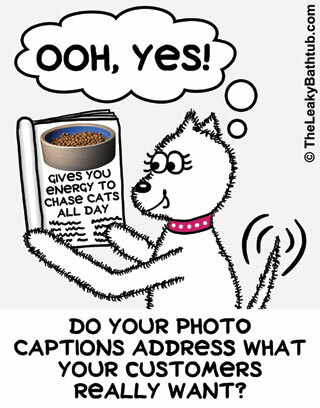 In the last post on writing photo captions we touched on incorporating a feature and benefit of your product and service in your photo captions. But what’s the difference between a feature and a benefit? Knowing the difference between a feature and a benefit is Marketing 101, but I’ve many small business owners struggle to differentiate between features and benefits when it comes to their own business. So if you’re not clear what the difference is, you’re not alone… and by the end of this article you should have a better idea of how this works for your own business. Once you’ve got that sussed, it’ll help you with many aspects of your marketing – not just photo captions! Car: does 50 miles per gallon. Dog food: contains 20% vegetables. Fountain pen: has a flexible tip. Accountant: provides clients with monthly reporting. Window cleaning service: uses chemical-free products. Viewed in isolation, most of these statements promote a “so what” response… so what if a dog food contains 20% vegetables? So what if a pen has a flexible tip? Features by themselves don’t make for exciting, compelling or memorable marketing. You need to put the feature into some kind of context. Car: Because it does 50 miles per gallon, you can spend your money on more fun stuff. Dog food: nutritionally-balanced to keep your pet fit and healthy for longer. Fountain pen: the flexible tip enhances your hand writing. Accountant: monthly reports come with easy-to-understand commentary so you know if your business is healthy – or in the danger zone. Window cleaning service: not only will your windows be clean, but the products we use are allergy-free for your family and pets. Do you notice something about these emotions? 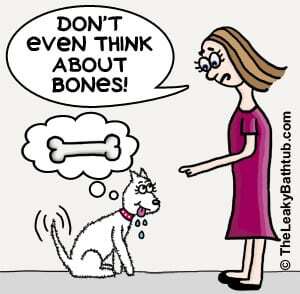 Sometimes the benefit draws on happy emotions (doing fun stuff; having a fit and healthy dog), but other times the benefit draws into a more negative emotion. For example, this fountain pen might appeal to those who are ashamed of their handwriting. And the accountant’s service taps into the fear that entrepreneurs may have of business failure. And so on. 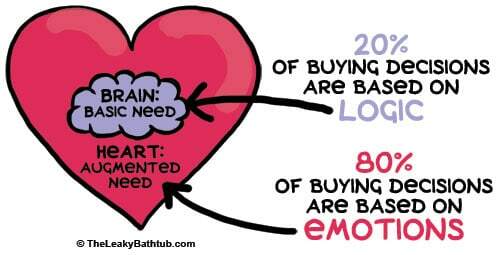 Often people will have a mixture of emotional drivers, but at the time of purchase one is often stronger than the others, which is why they’re taking the plunge to buy from you. How does this tie into marketing – and into photo caption writing? The basic need, which is where the logical stuff comes into it. The augmented need, which is where your heart and emotions start getting involved. In short: there’s a difference between the things we need, and the things we want. We may not need that new dress we’ve just splurged on, but we want to feel good about ourselves. Let’s just look at these emotionally-based augmented needs in a little more details, so you can understand just how far you can go with stating the benefits of your product or service. Have you heard the saying that people don’t want to buy a drill, they want a hole? One-upmanship: they want to show off their new art to friends and family. Nesting: they want to create a cosy, comfortable home. Procrastination: they don’t like home maintenance. 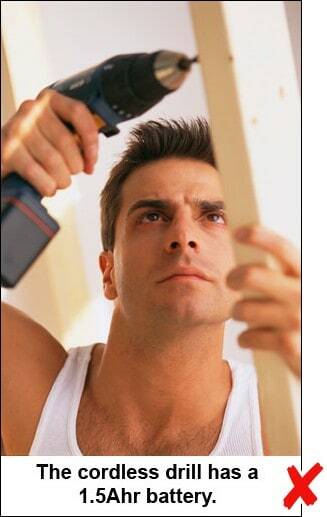 Fear: they don’t like using power tools… but know they have to. This caption makes me think, “so what”? Just stating a feature does nothing for me. Is a 1.5Ahr battery good or bad? I have no idea! This is better! Notice how this caption incorporates a feature (the 1.5Ahr battery) as well as a benefit. It makes it clear to the reader that a 1.5Ahr battery is a good thing to have. 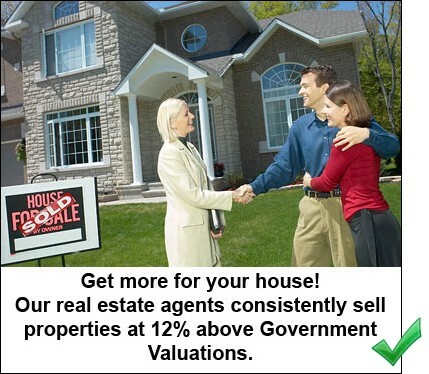 The basic, logical need that a real estate agent fulfils is that to sell a house. Wealth-driven: wanting to get the highest possible price for your house. Fear: some people hate negotiating and want someone to do that for them. Convenience and time-saving: having someone else take care of viewings. This caption attempts to state a benefit: but without a feature to back it up, it’s wishy-washy and provokes a “so what” response. Essentially it’s just a bland statement. Just because buying decision are 80% emotionally-based, it doesn’t mean that you can forget about the 20% logical (feature-based) element. Consumers will need some logic when justifying the purchase either in their own minds, or to their spouse or friends. In short: your marketing need to address the features AND the benefits of your product or service. One without the other will not work! Features by themselves are boring and provoke a “so what” response. Benefits by themselves can be wishy-washy and may also provoke a “so what” response. Benefits put features into context. Benefits should draw on emotions: either positive or negative. You need to draw on the strongest emotion that your customer is likely to be feeling when purchasing your product or service. It’s important to still state the feature in your marketing, because consumers will need this to justify their purchase (in their own minds, or to other people). Combining a feature and benefit in photo captions gives it maximum impact. This eBook is packed with tips to make your marketing materials more effective! Are you looking for more ways to make your marketing photography more effective? Discover more tips on making your marketing photography more persuasive in my eBook ‘How to Choose and Use Eye-Catching Photographs for your Marketing’. 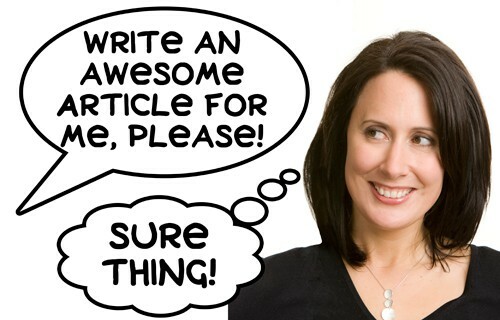 … And in this article, you’ll discover the techniques to write great photo captions for your marketing. Have you ever played a memory game with a group of friends? You know, the kind where everyone adds an item to the list, and you have to remember what everyone else has said, as well as adding your own item to the list. It gets quite hard, very quickly! Imagine if you only had to remember one item… it would be a very dull game, for sure, because it’s too easy. Anyone can remember just one item. When you’re writing photo captions, you want people to remember just one thing. Yes, just one thing. Simply stating what’s in the photograph is a missed opportunity: you can do better than that! To write a more powerful photo caption, you need to incorporate a benefit of your product or service. 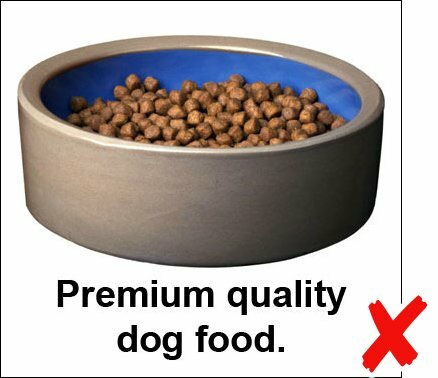 So for the dog food photo caption example, what benefits do you think the premium quality dog food may have? Yes, pick just one benefit – and it needs to be the one thing that is most likely to motivate customers to buy. This benefit needs to address the biggest worry or concern your target market might have. While things like glossy fur and clean teeth are nice things for a dog to have, the biggest concern a dog owner will usually have is longevity. Dog owners get very attached to their pooch, yet the dog may live for just 10 to 15 years… not nearly long enough, for something you love so much! 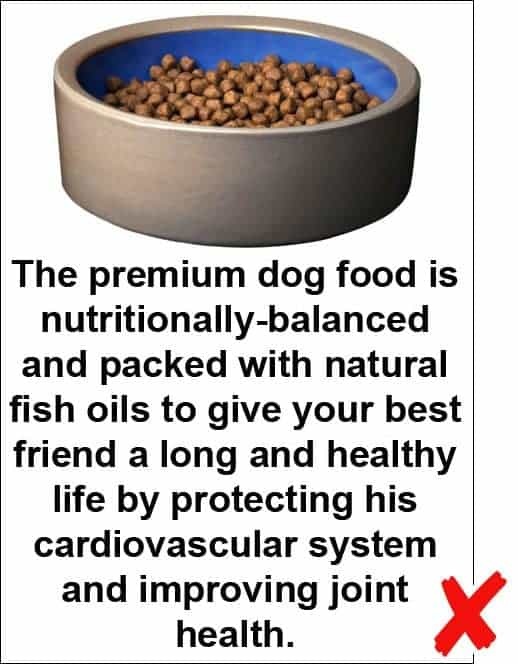 So a product that (realistically) promises a long and healthy life is something that’ll tug at the heartstrings of dog owners, motivating them to buy your product rather than your competitors’ offerings. But before you write the caption, there’s one more thing to address. And that is, to make the caption believable. This caption would most likely be met with a skeptical, “yeah, right”, and you need to avoid that. You need to make your caption believable. To make the caption believable, you need to tie in the feature that corresponds with the benefit you’ve chosen. 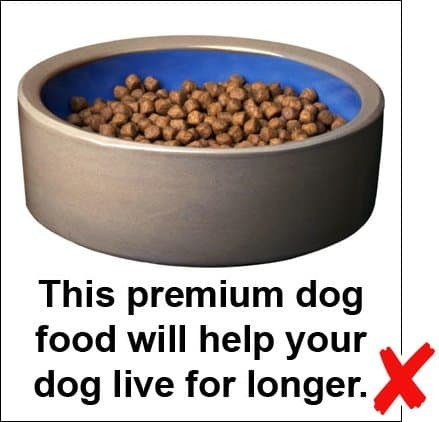 In the dog food example, it would be the nutritional aspects of the food that help to justify that claim. But again, pick just one feature, not a bunch of features, or it’ll get confusing. Ta-da! There’s your ideal photo caption. 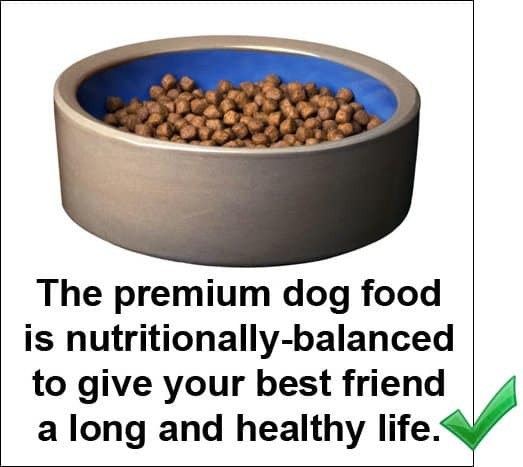 Because this premium dog food is nutritionally-balanced, your dog can enjoy a long and healthy life. There are a number of ways in which the message in the caption can be phrased, there’s no one single right answer. But notice how all these caption ideas incorporate just one benefit, and the one corresponding feature. Sidenote: A photo that would be more appealing than one of dog food would be a picture of either (a) a cute, healthy-looking dog enjoying eating the dog food, or (b) a cute, healthy-looking dog running through a flowery meadow – the perfect picture of good health. But the reality is that we don’t always have the perfect photo to work with, and when you’re a small business owner, it’s often about making the most of what you’ve got. So for now, focus on writing great captions for the photos you’ve already got… but do make it part of your plan to obtain better photos if you need to. Before you finalise your choice of caption, give it a quick breath test. Phew, that’s far too long and cluttered! Do not use captions this long: you’ll be out of breath, and your readers will be confused. But what about writing captions for a service? The example so far has been product-related, i.e. to dog food. But what if you’re selling a service? Exactly the same rules apply. Let’s look at a quick example to see photo captions for a service in action. The service we’ll look at is also canine related: we’ll use a dog walking service as an example. This caption is too short and gives us the “so what” factor: Dog walking service. Using a caption that just talks about a feature gives a “so what” reaction too: Our dog walkers have been police checked. Instead we need to talk about a benefit; specifically, one which addresses the prospect’s primary concern. And if you were looking at a dog walking service, your primary concern may be that the dog walker treats your pet responsibly and with good care. 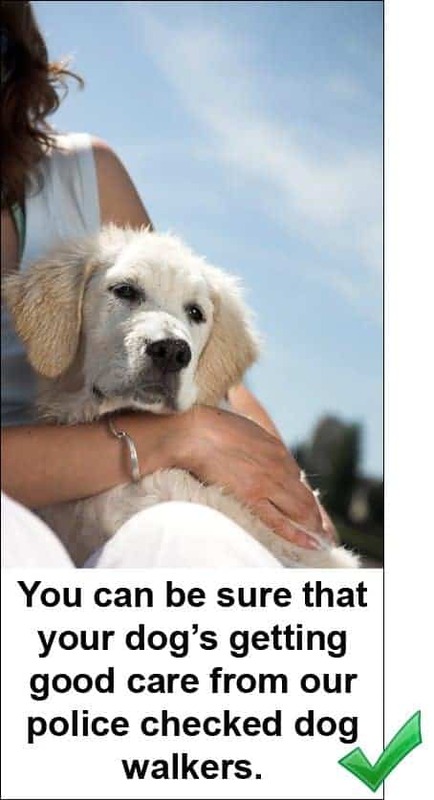 In short, you want them to take the same good care of your dog as you do. Someone that’ll be kind to them and keep them safe. So a good caption might be: You can be sure that your dog’s getting good care when you’re at work. And to make the caption even more believable, you could add in a feature to justify the benefit, e.g. : You can be sure that your dog’s getting good care from our police checked dog walkers. And let’s look at an example that’s far too long and confusing, and fails the breath test (so you know what not to do): Our dog walking service is convenient if you work long hours, plus our dog walkers are police checked and have pet first aid skills for your peace of mind. The caption makes it obvious what’s in the picture, or puts the picture into context. It tells the reader something extra in addition to the obvious, i.e. you avoid the “so what” syndrome. You state just one benefit: ideally this benefit will be your prospect’s biggest motivator. You use one feature to back up the benefit (if it’s needed). The caption passes the breath test; you can easily say it in one breath. If you work through this process when you’re writing captions for your own photos, you’ll be able to create something compelling that’s also easy for readers to remember… no memory games required! PS. Imagine how dull this article would be without the graphics! That’s why photos and captions are so important: they help to lock in the learning. If you want your clients to remember what you’re telling them, be sure you’re using all the tips in my eBook, ‘How to Choose and Use Eye-Catching Photographs for your Marketing’. Where you can find quality photographs – on any budget. The importance of where the model is looking in a photograph. How to choose a photo that won’t date too quickly. How to combine words with images (captions are just one of the techniques you can use). How you can create drama with photographs through size, positioning, angles and borders. 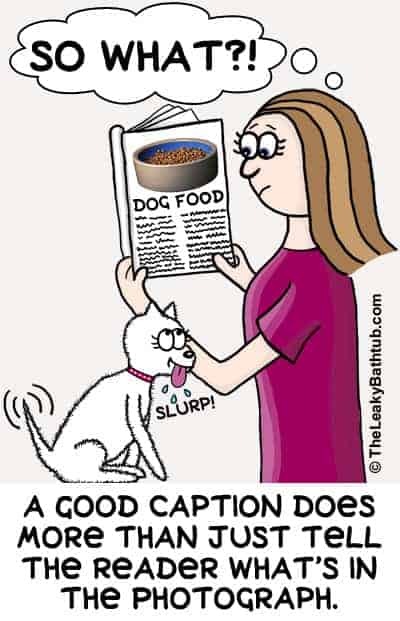 Photo captions are twice as likely to be read as the body copy… so you can double your readership with just one sentence! A dentist I know uses the catchline ‘only floss the teeth you want to keep’. Yes, dental humour is quite, um, unique, but I guess the dentist was fed up with his clients complaining that flossing is a tedious chore that they forget to do. 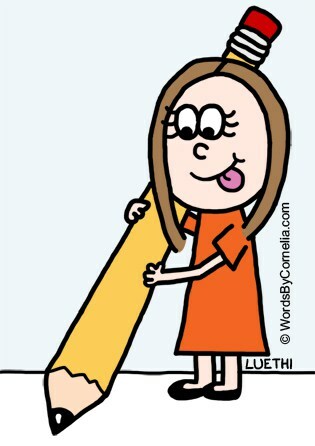 Flossing is one of those chores that we know we should do, but it’s just not very appealing. These non-appealing chores aren’t limited to dentistry; they exist in business life too. Eh? What have photo captions got to do with memory? A lot, actually. It’s been proven that readers are twice as likely to read a photo caption as they are the body copy of your marketing piece. What’s more, the combination of photo plus caption gives your marketing piece really strong visual branding. The photo and caption combo help to lock your message into the reader’s brain. It captures people’s imagination far more than words alone do. Photograph + Caption = Visual Branding Extraordinaire! The eagle-eyed readers amongst you will have spotted that not every article on my blog has an image (gasp!). It’s a work-in-progress: I’m gradually adding images (usually cartoons) for each article. Naturally, I want to promote the articles that I’ve written. (Even the ones without images.) So I’ve got a neat gadget on my website that automatically posts links to my blog articles on Twitter every couple of days. And I’ve noticed that it’s the blog posts with images that are getting more “re-tweets”, more mentions, and more web traffic. A coincidence? No, I don’t think so. The articles without cartoons are just as well-written and insightful as those without cartoons… but the visual imagery of the cartoons creates a far stronger visual impression than words alone. And yes, the cartoons have captions. You don’t have time to write one little sentence? Really? That’s all that a photo caption is: one sentence! And remember, this little sentence is twice as likely to get read as the whole page of blurb you’ve just written. So I strongly suggest you take the time to write that one measly sentence! Admittedly, sometimes photo captions don’t look so hot. If that’s the case, you need to have a wee word with your graphic designer. Or if you’re DIYing, get a graphic designer to help you, or else look at materials that do make good use of captions, to get you inspired. Remember, your marketing piece is there to sell, not just to look pretty. 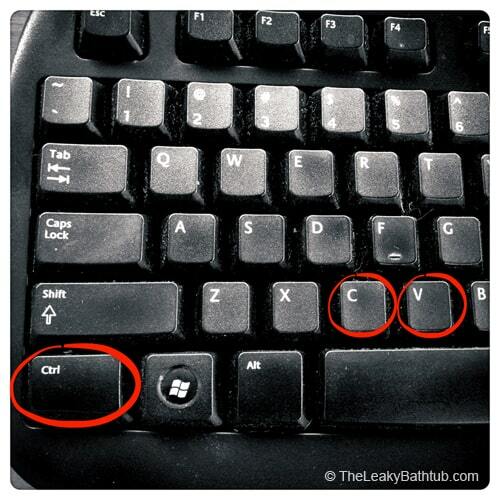 Insist that captions are used; it will be worth it! Like the idea of captions but don’t know how to write them? Stuck on how to write photo captions? That’s something we’ll look at in the next blog post. We’ll look at what should be included in a photo caption, so that you can write photo captions with confidence. 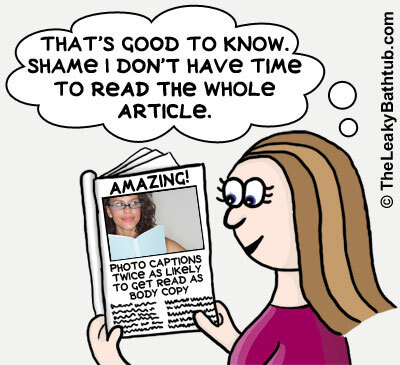 Photo captions are twice as likely to get read as the body copy of your marketing materials. Photograph + Caption = Visual Branding Extraordinaire. The visual branding helps to lock in the message you’re communicating. Want more tips on how to use photographs to help increase sales? 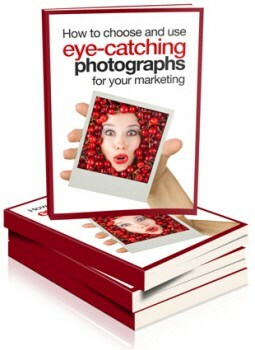 Then check out my eBook, ‘How to Choose and Use Eye-Catching Photographs for your Marketing’. The eBook has a whole chapter on writing memorable photo captions, plus other little-known tips on making your marketing materials more effective.